At first glance, I'm just your average human. But the light that comes through my eyes tells a different story. I'm that character—sometimes seemingly conventional and other times outright outrageous—with a zany streak. After some adventuring around the world (see below for the story + my bio) I dove into the acting world and haven't looked back. I've been lucky enough to have incredible teachers and mentors along the way. To name a few people and places: Bob Krakower, The Actor's Center, Michael Howard Studios, Scott Freeman, T. Schreiber Studios (conservatory program) and Lynn Singer. Emmy Award Nominated Pat McCorkle and Tony Award Winning Cheryl Wiesenfeld count among my guides. My work has been featured by The New York Times, CBC, Roma C'è, Backstage, and NY1, among others. You can keep up with me on my entertaining newsletter. Your email = un secreto. The double opt-in is all the rage these days (and required), so you'll need to confirm your email address. These confirmation emails have a way of hiding themselves, so if it's not in your inbox you may need to take a peek in your "Promotions" tab (if you have Gmail) and your Spam folder. TV: Veep, All My Children; Film: Beautiful Something, When Harry Tries to Marry, Bittersweet Monday; Theater: The Balcony, On the Border, The Maid Captured; National and Regional Commercials: Servpro, Zappos, Lottery; Solo Shows: Garbo Dreams, Queens Girl. Moth Story Slam Champ. Proud member of SAG/AFTRA, Dramatists Guild and NYWIFT. I learned how to fight fair growing up in Queens, NY. Wesleyan helped me realize that I didn’t have to choose between being a science nerd and a critical-theory-reading jock. I fell in love with live performance in San Francisco, where I shared the stage with fierce performance artists. I was honored to receive the William J. Clinton Fellowship for Service, which I used to work in HIV prevention while studying Bharatanatyam, a classical Indian dance. My perspective on privilege and purpose changed dramatically while living in India. Shortly thereafter, I returned to NYC and dedicated myself to television work, creating several one-woman shows and sketch comedy characters, and collaborating with producers and directors who seek out and celebrate the unusual. In short: I'm actor who is relentlessly dedicated to evolving my craft, and can assure you that I'm never, ever boring. Game? ON! Take a moment to look around this site. Keep up with me by joining my mailing list, or finding me on Facebook, Twitter, YouTube, and Instagram. I did a brief stint as a high school Chemistry teacher in Oakland, CA...and almost blew up the classroom several times. I'm in New York Public Library junkie who constantly requests books and relentlessly uses their app for character research. I find purchasing a New Yorker to be simultaneously thrilling and stress-inducing because I feel pressured to get through all the incredibly long, but beautifully written articles. I'm 100% Italian-American (how I look Swedish, no one knows!). Although I lost my accent, I bring it back in various shades for my characters. Fawgetaboutit! I'm on a national speakers bureau to present on LGBTQ+ Old Hollywood history. I hate sunlight to the point that I carry a big umbrella around NYC in the summer. Darling. I'm a junior-level Bharatanatyam dancer and make a mean sambar. I worked at Restaurant Florent as an overnight host right before it closed...and dressed as a different character every night. Most of my comedy heroes are no longer alive, like Moms Mabley and Ruth Draper. I know A LOT about the 1920s and 30s celebrity gossip (thanks to my play Garbo Dreams). I produced the annual Golden Girls NYC tribute to benefit SAGE and played Rose—klingen spritzr flaken gugen floogen! 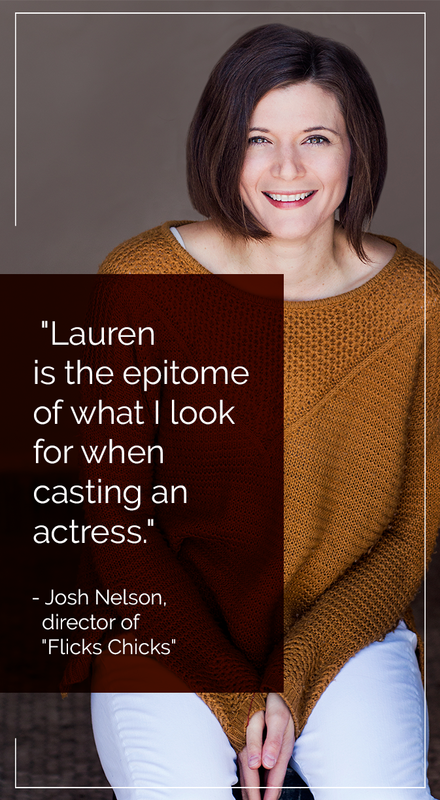 For Lauren's Comedy Website Click Here.